The Barnes & Noble Nook HD is the latest 7-inch tablet to hit the shops, but can it take on the Kindle Fire HD? Update: While the Nook HD and Nook HD+ only previously included a cherry-picked selection of top line apps, as of 3 May 2013 the Google Play store will now be available on both devices. Customers will also have access to Google Search. The Nook HD is one of several seven-inch tablets currently taking the world by storm. While the Google Nexus 7 was the first diminutive tab to really get tongues wagging, it was the launch of the Apple iPad Mini that really cemented the 7-inch slate as the latest tech must-have. Launched alongside the 9-inch Nook HD+ and the Nook Simple Touch with Glowlight, the Nook HD is set to go head to head with the Amazon Kindle Fire HD. Aside from the backing of parent company Barnes & Noble (probably the biggest name in book retailing in the US), the Nook HD's main selling points are its full HD screen, lightweight build and the ability to set up multiple user profiles. Measuring 194 x 127 x 11mm and tipping the scales at just 315g, the Nook HD is lighter than the Kindle Fire HD and very slightly slimmer and narrower. The back of the tablet is covered with a tactile, rubberised finish, while the front sports a raised bezel with a matte plastic feel. The result is a device that's very comfy to hold, even in one hand. However, the bezel does mean that the design doesn't look to too slick and it actually gives the impression of a separate (somewhat 'budget') casing - although you can't take it off, obviously. The only button that you'll find on the front of the device is the Nook Home button. The right-hand edge of the device is home to the volume rocker, and you'll find the power button on the left and a headphone socket on the top edge. The Nook HD is available in Snow or Smoke (that's white or grey to you and me). Aside from the headphone socket, there's not much else to talk about when it comes to connections. There's no USB (or micro USB), so you'll need to use the Nook's own cable for charging. What you do get is a microSD card slot making it possible to expand the on-board memory (of 16 or 32GB, depending on the model) up to 64GB. You'll need this if you're planning to store HD videos, as the capacity will get eaten up pretty quickly. The provision of extra memory is more than you'll get on the Google Nexus 7 and the iPad Mini, but then they are offered with higher fixed capacities. The slot is hidden behind a pull-out cover which is a little tricky to get into, but at least that means it shouldn't open accidentally when it's in the bottom of your bag. As you'd expect, the Nook HD has both Wi-Fi and Bluetooth 4.0. The Nook HD's screen is very impressive indeed - the 1440x900-pixel resolution offers up a pixel density of 243 along with 720p video playback making it the highest resolution screen available on a 7-inch tablet. The screen is of the fully laminated variety which means that there no air gaps, which is intended to reduce glare and improve clarity. We tried out the video capabilities alongside a Google Nexus 7 and the difference was very pronounced, with the the Nook offering a far sharper, brighter picture - coping particulalry well on details in dark scenes. The audio is also reasonable, although switching from the small rear-mounted speakers to a decent pair of headphones will give you better results. As we any backlit screen, we found that it was a bit of a strain on the eyes after a while when reading a book, but not more than any other tablet. If you're planning to read for extended periods of time then a dedicated ereader like the Nook Simple Touch with Glowlight or the Amazon Kindle Paperwhite might be more suitable. As a deivce that's pitched at family use, the Nook HD enables you to set up numerous profiles - one for each member of the family and up to six in total. Each profile can be personalised with different wallpaper which will display all of the content on their homescreen. The whole experience is much simpler than what you get on a standard Android tablet. Content can be shared across profiles from the primary account. It also means that anxious parents can block certain services (such as web browsing) from the nippers' profiles and restrict shopping access to child- friendly content. Spoilsports. The web browser is nice and easy to use - it's quite basic, but it does the trick - you can do all the usual things like bookmark pages and browse multiple tabs, while Article View will make text full the screen, minus the pictures and other gubbins so it that it feels more like you're reading a book. The UI can be slightly slow to pick up some gestures, so it's not the slickest experience ever. As you start to scroll down the page, the url and tab disappear from the top so that the web page fills the whole screen. It's a nice touch until you want scroll back up and the top bar reappears and obscures the top of the page. 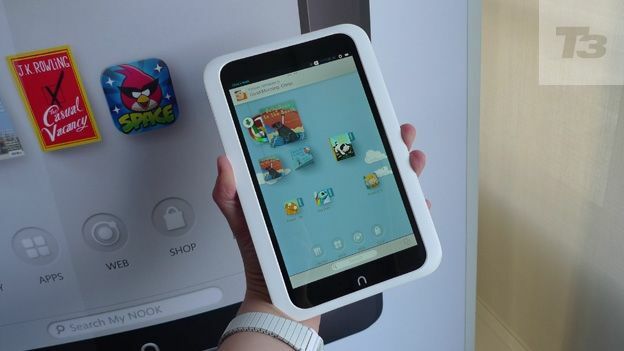 The Nook HD runs on Android 4.0 Ice Cream Sandwich, although the Barnes & Noble has built its own user interface on top, so it that it has its distinctive look and feel. Powered by a dual-core OMAP4470 processor running at 1.3GHz, alongside 1GB of RAM - the Nook can't compete with the quad-core chipset of the Nexus 7, but it does fox most of its other rivals when it comes to processing power. Despite some impressive processing specs on paper, we found the Nook to be a tad on the slight side in terms of powering up and changing screen orientation. While Barnes & Noble is a household name across the pond, the brand is likely to have more of a struggle asserting its place with UK consumers. However, the brand told T3 that they've launched Europe-specific B&N store, so we're not just getting the US content shipped over to us. On magazines like T3, you'll find a nice, lifelike page turning action which even shows the back of the page as it turns, revealing the text on the other side, as if you were looking through a piece of translucent paper. We also liked that fact that you can make scrapbooks using pages 'torn' from virtual magazines - something which may well appeal to the Pinterest users of the world. When it comes to books - there are plenty of options for altering the background colour and the size, font and spacing of the text and it's also easy to add bookmarks, notes and highlights. Pressing and holding a word will bring up a menu where you can look up the meaning or highlight a word or chunk of text. According to Barnes & Noble, the Nook HD ofrers Up to 10.5 hours of battery life for reading or up to 9 hours of video. We found that we could get a fair few days of normal usage out of the Nook before having to recharge, although obviously HD video snaffles up the battery a fair bit faster. The Nook HD is a good product at a great price. We loved the excellent screen and the comfy grip and we also liked the magazine reading experience. The downside is that they're are other similarly priced products that do a similar job in an arguably better way. The Nook HD feels a little sluggish when compared with the likes of the iPad Mini and the fact that you only get access to a ring-fenced selection of apps, rather than the whole of Google Play, may put some people off. It may not be the very best 7-inch tablet around but it's a great family product thanks to its multiple user profiles and relatively sturdy build but the Google Nexus 7 probably offers better value for money.